Enjoy our special discount of 100€ on the electric bike trailer equipped with a 1000w motor. The Xtrême kit is a very strong motor, specially designed to carry load. It is able to push the trailer with a load of 45kg, the bike and the user. You just need to choose a 36 or 48v battery, depending on the intensity of your use and the speed you would like. In terms of autonomy, you can reach up to 100km and even more, depending on the capacity of the battery. If you are a bike traveller, the trailer can increase the distance of your trips and get you even further. Daily, the electric trailer can replace your car to carry your purchases. For professionals, it becomes easy to move from one place to the next with material or to make deliveries. 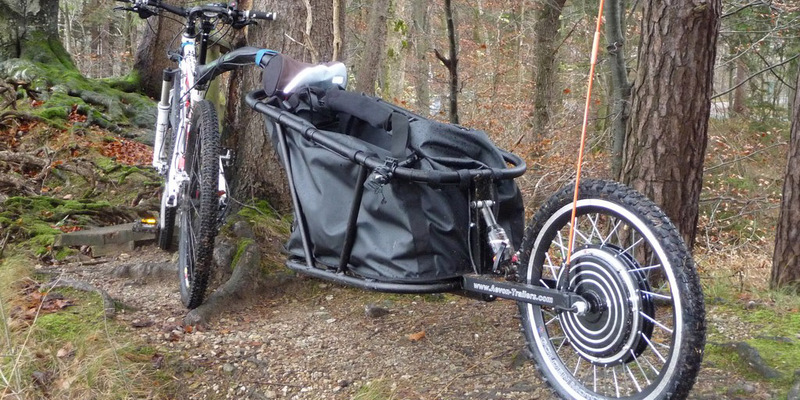 The Aevon bike trailer is able to carry up to 45kg on roads and up to 35kg on MTB tracks. Its aluminium frame is designed for an intensive use and the hitch system on the seat post enables your trailer to follow you on any type of track.